Fleet came away from the EBB Stadium with a smile on their faces for the second time this year and their first double as two second-half goals saw off Aldershot Town. Michael Cheek’s scoring streak continued, Danny Kedwell made it 60 club goals and Nathan Ashmore chalked up his 50th clean sheet. As expected, Garry Hill was forced into two changes, Sam Magri and Ebou Adams coming in for the latest injured duo, Dave Winfield and Andy Drury. 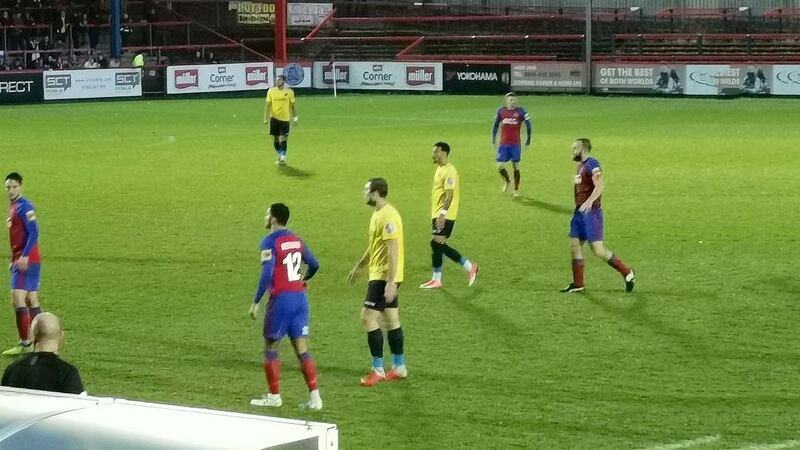 Aldershot had injury problems of their own, to such an extent that they could name only three substitutes while Fleet at least made up a full bench, even if Dean Rance was unlikely to be called upon. 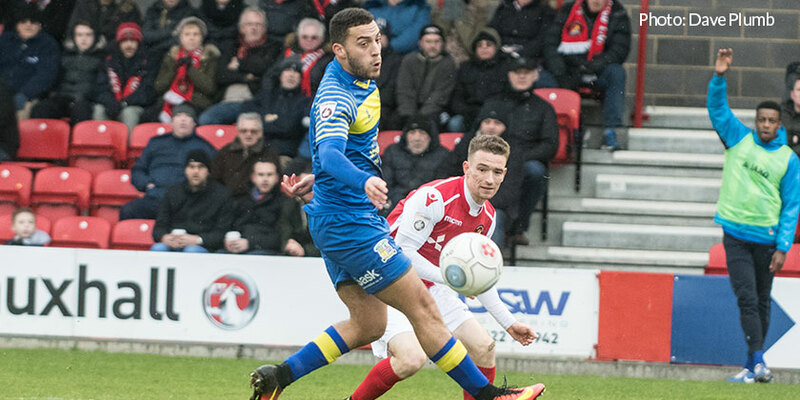 The Shots reliance on loanees also counted against them as five were in their lineup, meaning the sixth – Regan Boooty – could not be named on the team sheet. Perhaps with that in mind, Fleet began with a confident air and Michael Cheek got ahead of marker Gabriel Osho on several occasions, fed by Danny Kedwell just behind him. The Shots took 13 minutes to get out of their own half for any significant time and Adam May’s shot at Nathan Ashmore was their only effort of note up until then. Adam McDonnell and McCoy down the right were the home side’s chief menace and when the latter played a ball in behind Chris Bush for Reece Grant to run on to, it took Ashmore to spread himself wide in the six-yard box. Kedwell looped a header just past the upright on 20 minutes as Fleet stepped things up again. Cheek got behind Osho once more to play a ball across the box. Goalkeeper Wilf Mannion was stranded but with Lawrie Wilson racing in to convert, a well-placed Lewis Kinsella was on hand to clear. Almost immediately the ball was returned back outside the box, from where Jack Payne smacked an effort off the crossbar. Aldershot enjoyed a little more time in the Fleet half after that but their distribution went awry far too many times and balls into space were far too ambitious to unsettle the visitors’ makeshift centre-back pairing. McDonnell saw yellow for going through Adams on the halfway line and Adams then tangled with Grant as the game became rooted in midfield. Fleet fans were briefly cheered moments before half-time when Cheek got the right side of Osho once more and despatched a shot past Mannion but with Payne pulled up for a foul, the assistant’s flag dampened any premature celebrations. All the good work was nearly undone in the opening moments of the second half as the Shots spread play to the right flank by May and Ashmore had to be down quickly to block a goalbound shot. 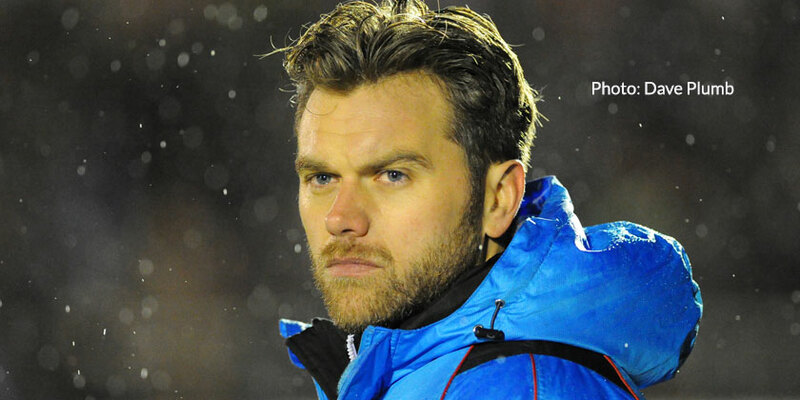 With Aldershot failing to take that big chance, Fleet made them pay. A throw from the right was flicked on by Kedwell, landing for Cheek who in current form leapt in to the space ahead of him and fired past Mannion for the opener. Aldershot tried to rally but were too guilty of overhitting their balls forward and neither King nor Magri were unduly tested. On 52 minutes, Kedwell – playing in a wider right position for much of the second half – showed a turn of pace combined with strength and got a ball into the middle. Aldershot flailed at it and McCoy headed against his own bar before the home side got the ball away. King had to make a crucial tackle as Grant almost got beyond the back line and substitute Luke Wanadio tried to enliven the home side but Fleet’s second goal killed that off. It came on 66 minutes when Myles Weston turned a pass outside to Whitely. He tricked his way into the box and rode a couple of challenges before his former Dagenham teammate Luke Howell tripped him. Kedwell made no mistake from the spot and despatched his 60th goal for the club. The Shots were a spent force after that. Adams tested Mannion with a shot from outside the box and Weston wasn’t far away from a Lawrie Wilson cross before that was cut out by Howell. Whitely broke with two men in support and decided on a pass to Kedwell that was cut out before a fine move from Kedwell to Cheek and on to Whitely to run in behind was pure instinct as Fleet threatened a third. It almost arrived on 86 minutes when Jack King hit the underside of the bar from a cross. Kedwell struck the rebound into a wall of bodies and King had another bite at the cherry that was hastily despatched by a defender. Substitute Luke Coulson was almost away in time added on before the referee called time on a fine three points for Garry Hill’s side.